Carol Nicholson has a unique and diverse background in music performance, teaching, and office administration. She is currently principal flutist of the Miami Symphony Orchestra (since 1994) and has been a member since the orchestra’s inception in 1989. She has performed with groups and orchestras such as the Miami City Ballet, Miami Lyric Opera, Boca Pops, Miami International Piano Festival, Palm Beach Opera and Symphony of the Americas. She has had the pleasure of coordinating many events as the Assistant to the Executive Director of the Florida Orchestra Association. Nicholson earned a Music Performance degree, as well as a Bachelor of Psychology degree from the University of Nevada, Las Vegas. She has participated in master classes and studied privately with Peter Lloyd (retired principal flutist of the London Symphony Orchestra), Geoffrey Gilbert, William Bennett, Trevor Wye and Julius Baker. 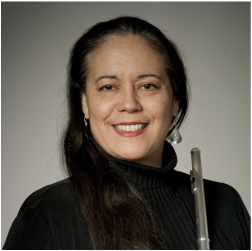 Carol Nicholson is a Member of National Flute Association since 1983.